krulle wrote: How about the time limit the game imposes on you? Good job Quasi! I think you just fooled krulle into believing you were me! I liked your battle descriptions, and they both deserve their own titles with something to the effect of “The Quasi-Maneuver” (which doesn’t make any sense when taken literally ) so I figure with some more practice I’ll do better in the future, as long as I can resist the urge to concentrate on using the tongue attack! Is that really what you meant? Oh man! I wish my UQM-HD worked! It’s never worked right; I can get it to play, but I always have to re-install it every time I want to play it. Bummer. Oooh! Oooh! I know! I know! Maybe a certain somebody’s avatar? No, I didn't mean Nemesis against Orz -although that makes sense in the case of boarding- and it's now fixed. You saw nothing. UQM HD can be troubling at times. It doesn't work on my laptop, for instance. Well, not in the normal case. Word of advice: try launching the uqmdebug exe rather than the uqm exe. They should be in the same folder. For some reason, it works only in debug mode on my laptop. The only real difference I've managed to spot is that uqmdebug opens a console in the background -assumingly for debugging reasons- and, if I were to guess, this window keeps the program "active" where the non-debug version doesn't have anything to keep it afloat in case of errors. It runs well enough for me. Albeit it's fully possible that the errors are completely different, and yours is something else entirely, but it's still worth a try, right? The Avatar? Nope, I'd definitely lose that confrontation. I mean, slaughtering fourteen Stingers with an Avatar is easy enough, but the other way around poses serious problems due to range issues and comparative weapon power. That's probably an encounter I would rather avoid for the moment... although don't count it out entirely. I might try it someday. I've never been good with the Stinger. Against the Mycon it is not that bad, I could get a lick in every now and then. Mainly by accelerating through bumping the podship until our speeds are matched, closing in and licking away (until the podship captain finally turns his massive ship and the opening points at you. Hmm, licking fusions plasma chimneys....). But the range of the Stinger is ridiculous low, against the Avatar you can do naught. The ZapSats keep you too far away from being able to do anything. To me, it belongs to the most useless ships. Now, if it would indeed grapple and keep hold of the other ship with a successful lick (possibly at the expense of reloading the battery during that time), you could lick away and finally do some damage (until batt empty, and if you try to shoot again, thus exceeding battery capacity, the grapple would let go). But the way it is? So I decided to go over one of the other ones which Troglodyte has already covered, sort of to demonstrate the flaws of the AI a bit more. Specifically, we're going up against the Ilwrath this time, and the result... feels familiar somehow. "You mean his WHOLE SPECIES are jerks?" - an unnamed Pik. Result: Stinger takes 0 damage worth 0 points. All Avengers are dead for a total worth of 140 points. So I went for killing a bunch of Avengers. They're generally easy prey for a Stinger, assuming that the pilot has some modicum of skill. Of course, the AI's a wee bit too stupid for that, but I know how to handle Avengers, so this wasn't really a tough battle. I'm a bit too good at predicting a cloaked vessel's position to be troubled much by the cloak. The common tactic is to simply stay outside of the Avenger's range, spraying antimatter on it until it dies. Then repeat until all the Avengers are gone. In general, there are only three things which may ruin your victory against an Avenger. 1. Gravity wells - Although gravity wells are generally more useful for you than your opponent when you play a Stinger, this particular setup is the exception. Within a gravity well, Avengers can reach speeds high enough to catch up with your commonly faster Stinger. Avengers are, of course, incredibly lethal to your ship at close range, so getting within range may very well equate to getting killed. Although cloaked gravity maneuvers are fairly hard to master -it took me quite a while to really get the hang of it- and should still be attempted only with caution even for those who are proficient at it, the Avenger's disadvantage may just render it desperate enough to try it regularly in an attempt to roast your poor Zoqs, Fots and Piks. 2. 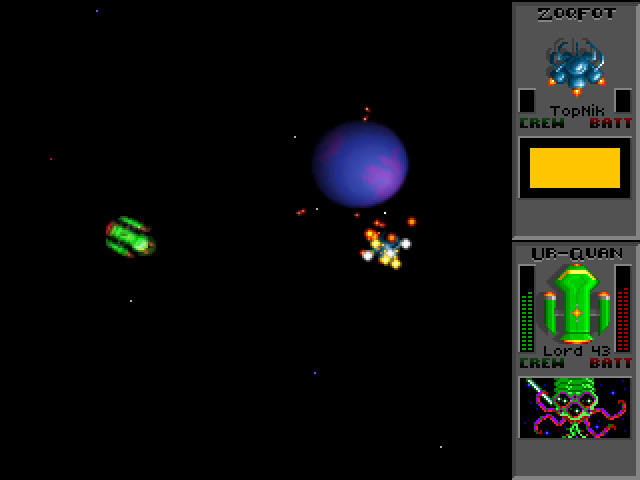 Asteroids - These are troublesome, as it doesn't take much to nudge a Stinger out of course. Even a non-moving asteroid is enough to slow you down, and that little change in momentum will often prove sufficient to push you into the Avenger's range. If you're lucky, you'll escape with minor damage, but reacting too slowly will, once again, kill you. 3. Lack of skill - It takes a fair bit of skill to be able to carry out this kind of tactic. Knowing where the Avenger is, knowing how to position your ship in order to be within range yet not within your enemy's range, knowing how much caution should be taken, getting the maneuvers just right for your ship to actually be where you want it to be... the list goes on. If you don't know what you're doing, you might end up trying to tongue the Avenger or something else stupid like that; some manner of skill with the Stinger is necessary in order to succeed. Like last time, we've got a nice screenshot down below; figured it couldn't hurt. The Troglodyte wrote: Oooh! Oooh! I know! I know! Maybe a certain somebody’s avatar? Preeeeety sure this was a sly reference to your avatar, Quasi. Think you can take down a fleet of Dreadnoughts with one Stinger? ...When you do, please post a video. krulle wrote: But the range of the Stinger is ridiculous low, against the Avatar you can do naught. The ZapSats keep you too far away from being able to do anything. Quasispatial wrote: The Avatar? Nope, I'd definitely lose that confrontation. Draxas wrote: Preeeeety sure this was a sly reference to your avatar, Quasi. Think you can take down a fleet of Dreadnoughts with one Stinger? I wasn’t talking about my avatar, or the Chmmr Avatar, but Quasi’s avatar! Good catch Draxas! Quasispatial wrote: UQM HD can be troubling at times. […] Word of advice: try launching the uqmdebug exe rather than the uqm exe. Ok, I’ll have to give that a try. Thanks. krulle wrote: Now, if it would indeed grapple and keep hold of the other ship with a successful lick (possibly at the expense of reloading the battery during that time), you could lick away and finally do some damage (until batt empty, and if you try to shoot again, thus exceeding battery capacity, the grapple would let go). But the way it is? An interesting approach to how the mechanics would work if only it had been implemented to at least perform some kind of function. Now that I think about it more, perhaps the Stinger is a representation of what the Zebranky used to be?… Huh, that would mean the ZFP had to band together to eradicate a bunch of bug-looking thingies! 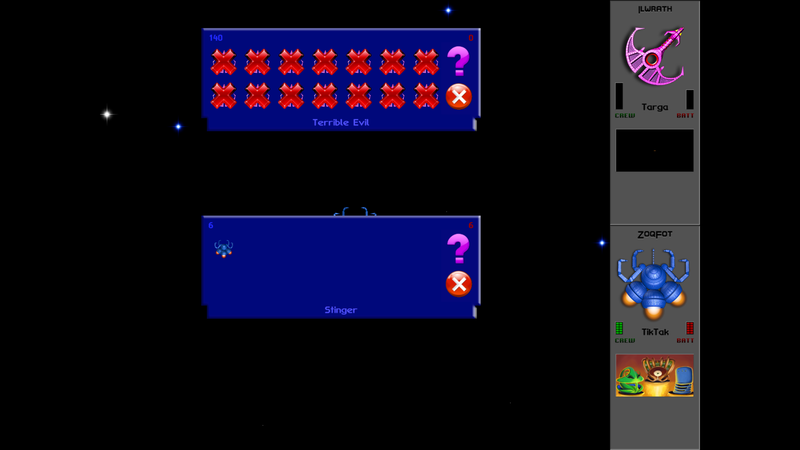 Quasispatial wrote: Result: Stinger takes 0 damage worth 0 points. All Avengers are dead for a total worth of 140 points. So I went for killing a bunch of Avengers. The theme I’m picking up on is… Quasispatial is freakin’ unstoppable! Quasispatial wrote: The common tactic is to simply stay outside of the Avenger's range, spraying antimatter on it until it dies. Then repeat until all the Avengers are gone. In general, there are only three things which may ruin your victory against an Avenger. Awesome tips! This may indeed be of great use when I make my way back into Ilwrath territory, so I’ll definitely have to practice using your techniques. Those dumb spiders won’t know what hit them!... I mean, er, they’ll know what hit them (that being a ton of antimatter spray) but they won’t be able to do anything about it! Bwah-haha! Ur-Quan wins with 13 remaining Dreadnoughts! ANALYSIS: Yup, this was certainly bad, only due to attrition was an entire ZFP fleet able to defeat one Ur-Quan Dreadnought, and that wasn’t until their twelth deployed ship! Speaking of deployment, the Ur-Quan always kept around 6 to 8 of their fighter deployed at all times to give the Stingers something to contend with while the Dreadnoughts could get within range of their Fusion Blasters. The ZFP slowly whittled down the Dreadnought’s crew by spraying the fighters with their Antimatter Spray, and the Ur-Quan simply kept deploying more until their crew levels were depleted down, at which time it became even more advantageous for the Ur-Quan, who were then able to focus their attacks while the Stinger vessel did its best to approach the Dreadnought while attempting to dodge all of the fusion blasts, which unfortunately they could not before getting destroyed one-by-one. Tragic. Kohr-Ah wins with 12 remaining Marauders! ANALYSIS: Even though the Kohr-Ah only lost 2 ships, they only barely won points-wise by a measly 24 points, and they came close to losing a 3rd vessel to the ZFP before they finally wiped out all 14 of their ships. 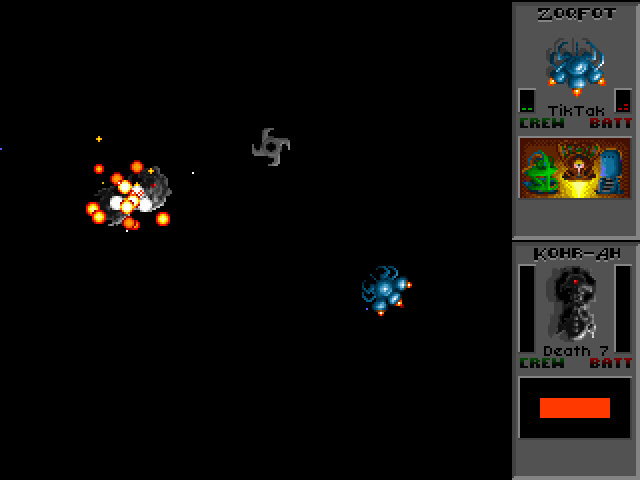 Strangely enough, at first it looked as if the ZFP were going to sacrifice 3 ships for every Marauder slain, considering that the first 3 ships managed to take down the first Kohr-Ah, but mostly because those first few Stingers worked themselves into postions where they could dodge the incoming Spinning Blades and then counter-attack with their Antimatter Spray, and the 3rd Stinger even took down the Marauder with a Tongue Attack! Remarkable! Unfortunately, that was the highlight for the Zoq-Fot-Pik in this match-up, and the remainder of Stingers couldn’t muster anywhere near their previous success, and they were subsequently picked apart by the power of the Kohr-Ah’s brute strength. I find the odds of that happening to be... low. I mean, I tried it with the Skiff a while back, but only got up to eight kills tops per skiff before I got bored of it some twenty matches in. The Stinger is even weaker. It isn't even fast enough to truly work well against the fighters, although I could probably fight the Dreadnought itself later on. That being said, perhaps I'll take the time to revisit some of the older ship discussions. Run a few games with, say, the Fury or something. For variety, you know.